on the South Coast of Cornwall. All rooms en-suite. Book the Lynwood Studio for a real holiday treat! 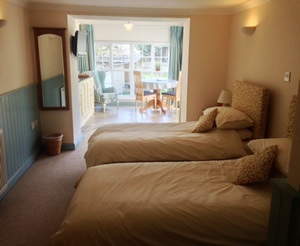 The sunny, open-plan studio is perfect for a romantic break. You may stay for short breaks or treat yourself to a full week away. 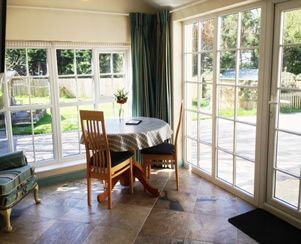 The mini kitchen in the Studio has all you need to make your own private breakfast – equally you are welcome to come next door and enjoy Abigail’s home cooked Full English with the other B&B guests. Twin beds zip together to create a comfortable king-size double. There is a z-bed available and/or room for a travel cot. The en-suite bathroom is really spacious with a large walk-in shower, separate bath, wash-hand basin, loo, bidet and heated towel rail for your fluffy towels. Soap, shower gel, shampoo and hand and body lotion are all provided. The living room/kitchenette is well equipped with a two ring induction hob, microwave, sink and standard small fridge along with kettle, toaster and a selection of kitchen equipment. Also included are a TV with Freeview and DVD-player, hair dryer, iron and ironing board, comfy chairs and a small table from which there is a pleasant garden view. For B & B guests, a selection of tea, coffee and hot chocolate are provided along with fresh milk and a small bottle of water. For visitors booking the Studio as self-contained accommodation, We offer a selection of teas, coffee and hot chocolate, a small carton of milk and Cornish biscuits. Please note all bedding and towels are provided along with a selection of toiletries, washing up liquid, paper towel and a loo roll. The village shop which is in walking distance is open 7 days a week for anything extra you may require. 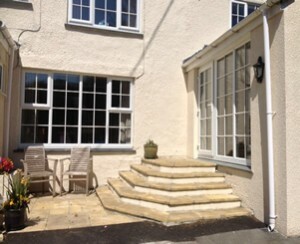 Outside there is plenty of parking, and as you can see in the photo, you have your own little south-facing sitting area which is a real sun trap – ideal for that cup of coffee in the morning or glass of wine in the evening. You couldn’t ask for a better place to stay. Please see below for prices and availability. 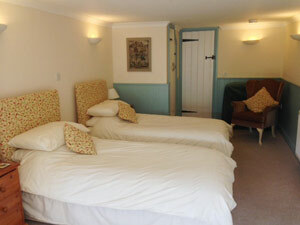 Prices are for self-contained accommodation only there are prices for two or three people. Depending on the time of year discounts for single occupancy may be available. For enquiries please click through to Contacts. Frogmore Corner and Froglets are our two dog friendly cottages both with parking and over looking River Fal and surrounding farmland, located five minutes up the road from Lynwood House for more information please follow the link. Please use the booking form for any enquiries.